How will sea level rise impact Stonington? A recent public meeting began the discussion. It may not be a matter of if but when, and how to plan for it, when it comes to coastal Maine and sea level rise over the coming decades. 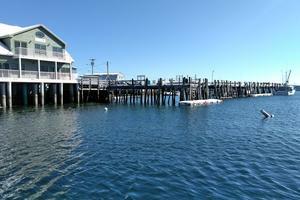 And Stonington is one waterfront town that is not chancing a wait-and-see approach. A recent $60,000 Maine Coastal Program Grant from the Maine Department of Agriculture, Conservation and Forestry has funded a study by GEI Consultants to assess where and how badly a rise of one, two, four or as much as nine or 10 feet could affect the town’s infrastructure. “It’s a way to hone in on the particular things that are critical for Stonington and come up with a solution,” said GEI engineer Leila Pike to about 20 concerned citizens and town officials at a March 5 public meeting at town hall. According to a 2017 National Oceanic and Atmospheric Administration study, the mean sea level will rise from a low projection of 1.5 feet to an extreme of 11 feet by the year 2100. Pike’s presentation showed how the study will assess flood risks to critical town infrastructure and ways to adapt in the short-, medium- and long-term, based on 30-year, 50-year and 80-year projections. Areas deemed sensitive to flooding include Main Street, with its pumping stations, Hagen Dock and fire department, Moose Island, Burnt Cove, Oceanville Road and Airport Road. The fish pier is the subject of a separate, grant-funded study and will “probably” be raised two or three feet, Pike said. “2100 is 80 years from now. How can we plan for that?” asked resident Hilton Turner. Pike said GEI will consult with the public works department on determining what elevation of flooding might damage a structure, and the study will highlight incremental adaptations, rather than plan for extremes. For example, short-term adaptation for a road covered with water during a storm could be placing signs or flashing lights, while a long-term adaptation could be raising the road itself. Towards that end, voters approved $25,000 for a Sea Level Rise Reserve Fund at town meeting March 9, that can serve as the town match for future grants. Once the vulnerabilities assessment is completed, GEI will hold a second public meeting to go over the results before designing adaptive measures, to be presented at a subsequent meeting. “There are a lot of places in the world where the towns just disappeared,” she said. 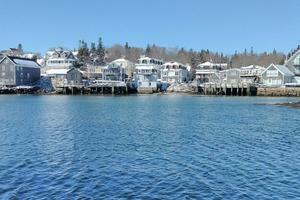 A Maine Coastal Program Grant will help Stonington adapt to a potential future sea level rise.